For the second season in a row, Skate Westgate will be open to the public. 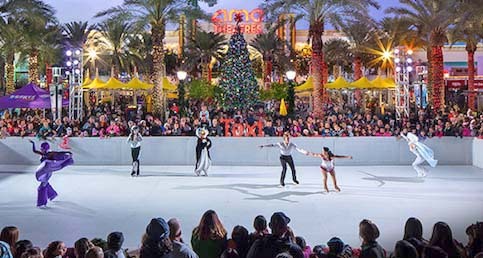 The park will open with a tree lighting ceremony and professional skating show. The lighting of the towering 36-foot holiday tree signifies the opening of the outdoor ice skating rink, one of few in the Valley. Along with the free tree lighting and professional skaters, Westgate will have free horse-drawn carriage rides, fake snowfalls and visits with Santa every open night. The skating rink runs for seven weeks from Nov. 21- Jan. 7 and over 7,000 people are expected to attend. Attendance will be up from last year where 4,000 people attending the opening ceremony alone. Prices for skating ranges from $11 for adults and children who bring their own skates, or $15 includes skate rental. Military and toddlers can rent skates for $11 and a season pass goes for $99. Every night, between 7 p.m. and 8 p.m. Fountain Park will be putting on an eight-minute snowfall show. On Christmas Eve, the snowfall show will run every hour from 11 a.m. to 8 p.m.
Four horse-drawn carriages will offer free rides from 5 p.m. to 9 p.m. After last year’s success, many local vendors will present offering a variety of fun activities for Phoenix area residents.